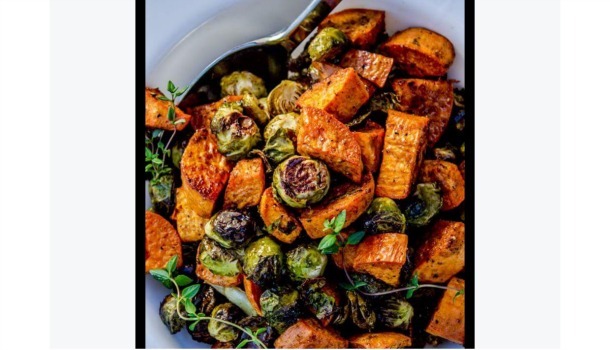 Today’s WINNING recipe to meet Coach JC’s 10 WINNING Habits is Roasted Sweet Potatoes and Brussels Sprouts. Have I earned my starchy carbs? Where are my veggies? Trim Brussels by cutting off the little brown end. if there are any yellow leaves, pull them off. Cut any large ones in half. Add to a large bowl. Peel your sweet potato and chop into 1 – 2 inch pieces. Add to the large bowl. Smash 2 cloves of garlic and add to the bowl. Pour 1/4 cup or less for avocado or olive oil over the vegetables. Add Cumin, garlic salt, salt and pepper to taste. Stir to coat. Line large sheet pan with foil. Pour veggies into pan. Roast at 400 degrees for about 40 – 45 minutes. Place the veggies in a serving bowl and toss with 1 – 2 tablespoons red wine vinegar if using. Garnish with thyme.